Diana Hobo – Free Pattern « think liz. Gosh, wouldn’t it be great if I could do a ‘free pattern Friday’ every Friday? So Anna Maria Horner just released a new purse pattern that reminds me a lot of my new free pattern just without straps! I thought I’d show it to y’all because it seems easy enough to make a few small modifications to my pattern to emulate her new clutch! 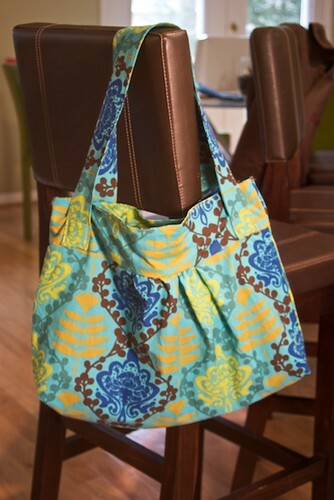 So remember this purse and my promise to give you a free pattern? Also this should go without being said but I’ll say it anyways: please do not sell items made from this free pattern and do not claim it as your own design! This entry was written by Elizabeth, posted on February 20, 2009 at 8:00 am, filed under Crafts, Free Pattern, Purses, Sewing and tagged Crafts, free, free sewing pattern, Purse, Sewing. Bookmark the permalink. Follow any comments here with the RSS feed for this post. Post a comment or leave a trackback: Trackback URL. Ok, this is totally awesome!! I love this design and will definitely make it! Not sure how soon but I will give it a try. Thanks for sharing! I’ll let you know how it turns out when I am able to make it. Where do you find your material? Where do you like to shop for it? Oooh I’m excited that the pattern is ready! I’ll test it! I have a conference coming up in a week that I’m preparing for now, but in two weeks, I should be able to start. Yay! Elizabeth – I find material at a variety of places, mostly online at Etsy. There are a couple stores in Austin that sell some good fabrics but sadly, my favorite is going out of business. There are the standards, like Joannes, Hancocks and Hobby Lobby, and then there are stores like Craftorama (going out of business) and others like it. I just got a bunch of great fabric on craigslist so that’s a good options too! Hope this helps! Jenn – Thanks for volunteering to try it out! I know it probably needs some editing. . .
Oh my gosh, your purse is so cool! Woo hoo, I know what I’m doin’ tomorrow. Thank you so much! Hi Elizabeth – I follow your blog and love your new pattern! I have bought my fabric, but now can’t seem to get the pattern pieces printed at home as my printer will not allow me to put 11 x 17inch paper in it… any suggestions on how to print the pattern? i dont see the pattern. where can i find it? Hi I love the hobo bag and would like to sew it up. The directions are easy to follow. If you would add the measurements of the pieces it would be very easy to cut and sew, no printing hassles. Thanks Anne for the comment – as I’m making revisions to the pattern in the next couple of weeks, I will be sure to include the measurements! I am anxious to make this bag but, like others, cannot print the pattern on my printer. Can you quickly give us the dimensions to all the pieces. This would be easier for me as I prefer to cut with a rotary cutter vs a paper pattern. My apologies Lynn – I don’t think I’ll be getting to this anytime soon as the program I used to create the program is at work and I am currently on maternity leave without access to the program. I’ll see if I can figure out a workaround to get you guys some dimensions, but I’m not promising anything in the near future. I have a new baby that’s demanding my attention right now! 🙂 Hope you understand! I just made one! woot woot! My first ever bag/purse. I also wanted to print it at home and since I don’t think I had enough fabric for the large one I just made a smaller one. In Print Preview you can reduce the size of what you want to print or you should see something that says “shrink to fit” and that’s what I did. I ended up with a small bag which is good for my first try. I got lost on the instructions though, I am used to a lot of pics. I didn’t know what basting is so I pleated by hand and it’s not perfect. Also, I didn’t quite understand some of the steps so when I was done my 4inch opening was on the front where now I realize it should have been inside. But overall this was super fun and easy! I own the Acrobat program version 8. I am able to print large pages by using the Tile Pages option. So your 3 pages of large sized patterns I now have on 6 pages of patterns on 8½ by 11″ paper. If you write to me, I can email you the 9-pages pdf file with your 3 pages of instructions, and 6 pages of standard sized patterns that can be taped together. What a great pattern, thank you! I came across this from another sewing blog I read. This pattern is really well designed, and I love that it is essentially reversible. Thank you so much! I’m glad you enjoyed the pattern – your purse turned out great!